“So also the tongue is a small member, yet it boasts of great things. How great a forest is set ablaze by such a small fire! From the playground to the boardroom. From the ball field to the church. From the youth to the elder. From the pagan to the saint. This is no place or person which will not be marred in some way by the flames of gossip. How appropriate that the tongue, and gossip specifically, is likened to a fire, because there are few things as ravaging and destructive. Yet as damaging as gossip is, it has historically been an accepted part of womanhood. A characterizing feature. A common joke. We have been created by God with relational and verbal capabilities that are rich and unique to womanhood. Yet we have squandered them on the cheapest of words. We have embraced what is truly the scourge of our fair gender. We can do so much better than that. 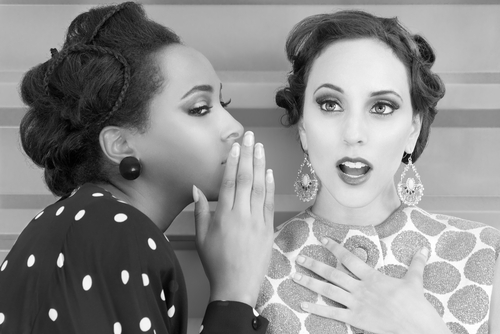 If you are up for a little education on gossip’s destructive tendencies, and in need of some encouragement in our hope for change, read on. Why is gossip so dangerous? Our position on gossip characterizes us for good or bad. If we participate in gossip, Proverbs teaches that we are fools (10:18), we lack sense (11:12), we are trouble-makers (16:28), we are not women who value or pursue good & truth (16:28, 17:4), and we are unattractively likened to piggish women greedily devouring tasty tidbits. (18:8) Ouch. How would people characterize us if they heard us speak about others? Our position on gossip has great impact on our friendships. To start off with, it determines them. Proverbs 20:19 instructs the wise not to associate with slanderous, secret-revealing, babblers. If any of that characterizes us, we need to face the fact that wise and noble-spirited women will not line up to be our friends. You can imagine then, how drastically that diminishes the pool of peers to choose from and therefore, the overall quality of our friendships. Not only does gossip destroy friendships because untruth or half-truths can cause suspicion or confusion, it also destroys friendships because a gossip is not a safe friend. Do not think for a moment that our name, reputation, information or honour are safe with a woman who would defame another person to us. If we are friends with a gossip, it’s only a matter of time before we are the subject of her words. That’s not going to be a sweet or lasting friendship. Gossip is hazardous to our collective well-being. If you’ve ever wondered where the expression “A little birdie told me…” came from, now you know. This is a delightful find in another biblical book of wisdom literature that warns us of how little control we have once words leave our lips (or our fingertips). No matter who a person is, how sensitive the subject, or how adamant their commitment to secrecy, everyone (with VERY rare exception) feels at liberty to tell just one more person. With each degree that the information is removed from the subject or the originator, the discretion with which it is treated diminishes. Let me explain: Though the information might have originally been shared with care and concern, the people who are further down the line of communication do not have the same connection or concern for the person or situation the information is about. As a result, it is to be expected that they will treat the matter with decreasing regard, the further away we get from the source. If you combine those two realities, we are poised to be perpetrators in a damaging chain of trust violation or character assassination. Once information or gossip leaves our mouths, it is free for anyone who hears to distribute as they desire and we have no control over the harm that may follow – Either to the subject of the information or to ourselves. Never is that more true than in the spread of gossip. For those of us desiring to live a life of gratitude, pleasing to the God who has rescued us from our own sinfulness, we should care deeply about what He loves and what He hates and then live accordingly. When it comes to gossip, until we agree with him about it, we’ll just keep doing it. Do you know that in the Old Testament, because of how contrary it is to God’s character and how destructive it is to enduring community, it was considered against the law? When God was giving his law to Moses for the people, he included a prohibition against slander (Let. 19:16). And any pass through the New Testament shows gossip and slander included in multiple lists of wicked and defiling behaviours. (Matt. 15:19, 2 Cor. 12:20, Eph. 4:31 to list a few…). When Jesus was asked what the greatest commandment was, he answered and went one step further. “You shall love the Lord your God with all your heart and with all your soul and with all your mind.” This is the great and first commandment. The second is like it: You shall love your neighbor as yourself.” (Matt. 22:37-39) Second only to loving God, we are to spend our days, our money, our energy, and our words for the good of others. Gossip isn’t just a naughty, social ill that is lightly poo-pooed. Gossip flies smack in the face of the second most important thing we could do on this earth. It is an epic failure in the call to love others. Ignorance – Some of us have simply not cared enough to give this matter much thought and therefore have lived in ignorance over gossip’s destructive power. Hopefully this little post will be a starting point for those of us who fall into this camp. Selfishness – Some of us savor receiving and spreading scandalous information because the delight we find in it, or what we have to gain from it, means more to us than the person in the crisis or mess. Self-Righteousness – Some of us enjoy hearing of other’s scandals & failings because when we compare ourselves to them, we like how it makes us feel. Anger & Malice – Some of us have been hurt and instead of extending grace and forgiveness, we relish the opportunity to cast doubt or spread information about the person that will wound them in return. Jealousy – Some of us enjoy questioning other’s motives and painting others in a critical light because we can’t stand the fact that they have more than we do, or seem to be more than we are. We use slanderous words in an attempt to level the playing field. Did you see yourself in any of that? I know I have. So who do we think we are, to use another person’s life, mistakes or misfortunes for our purposes, gain and enjoyment? I can tell you because I am one: We are selfish sinners in need of God’s ongoing rescue. Women hopeless to conquer this verbal scourge unless God’s love in us fuels our words. Words that diminish become words that elevate. Words that divide are replaced with words that unite. Words that expose are exchanged for discerning silence. And words that destroy are transformed into words that build. Two more weeks until the verse sign giveaway. If you subscribe to the blog or share this post, please leave a note to let me know and I’ll get your name into the draw! Like the ring of the “Surette laws” – there should be a few more of those. I had never made the connection between twitter and tweeting before – interesting! I too, never nade the connection about the ‘tweet’ before! I’ll never forget the day (in 11th grade) when I learned this lesson the very, very hard way. That doesn’t mean I don’t still struggle with it sometimes, but God used a lot of pain that day to make me realize the danger of gossip and the foolishness of “friendships” with other Gossips. Thank you for this much-needed post, Janet. It’s Truth, and I love it.